The holidays are a time to gather with loved ones and celebrate everything the season has to offer. Even though there's plenty of laughing, eating, and celebrating, there can also be a lot of stress for some people, and for someone with aphasia or other communication disorders, the stress can have a severe impact on his/her interactions with family and friends. 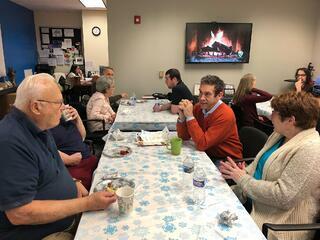 With parties, family dinners, and purchasing gifts, it's a busy time of year with a lot of social interaction for those with aphasia. The holidays can be an equally stressful time for caregivers as well. Not only do they need to juggle all the things associated with the holidays, they also have to make sure they're supporting their significant others through their recovery journeys. 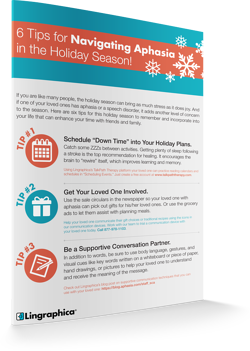 Lingraphica understands these struggles and has created a holiday tip sheet designed to help those with aphasia feel included in holiday festivities. These fun and helpful tips encourage conversation and participation in social activities. Along with these suggested ideas, we've listed various resources to help people with communication disorders and their families outside of the holiday season. We encourage you to print out these tips out and keep them in a place where you will be reminded of them often, like the front of the refrigerator or a bulletin board. From everyone here at Lingraphica, we wish you a safe and happy holiday season!